ISTANBUL — China has issued a travel warning to its residents visiting Turkey, in a move seen as targeting Turkey’s large tourism industry. The advisory is the latest escalation in bilateral tensions after Hami Aksoy, a spokesman for the Turkish foreign ministry, condemned China’s treatment of its Uighur minority. The northwest Xinjiang region of China, home to most of the country’s Uighurs, has been under heavy police surveillance after years of ethnic tensions that have sometimes exploded into violence. The Chinese government calls its crackdown a counterterrorism effort. In the past, Turkish President Recep Tayyip Erdogan advocated for the rights of Uighurs, who are ethnically related to modern-day Turks, and the country often received Uighurs seeking asylum. In recent years, however, analysts say booming trade with China became more of a priority for Erdogan and his government. “They stopped talking about this burning issue, preferring an economic relationship with this giant country,” political scientist Cengiz Aktar said. Erdogan is a conservative Muslim and has been increasingly positioning himself as a defender of global Muslim rights. The Turkish leader regularly condemns Burma’s treatment of Rohingya Muslims, and he is vocal in his support for the Palestinians. 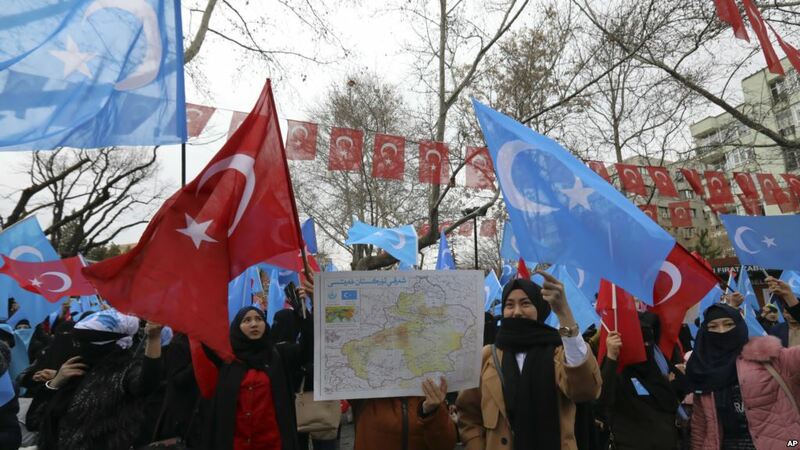 Aktar said the growing international condemnation of Beijing over its treatment of Uighurs forced Ankara to speak out. “The issue became universal, and there were reactions all over the world especially from non-Muslim countries. So, [Turkey] felt simply compelled to react to it,” he said. Election politics also is a factor, with Erdogan’s AKP Party competing in hotly contested local polls next month. Analysts say backing the Uighurs will play well among religious, conservative voters. Analysts expect Beijing to impose further economic sanctions on Ankara, meaning the price Turkey will pay for standing up for the Uighurs in China could be considerable.